The Petal Gown by Amanda Garrett is simple yet effortlessly beautiful. Strapless French lace with beaded lace bodice dress flowing softly over the knee. Corset built in. Perfect for a relaxed yet romantic bridal setting! 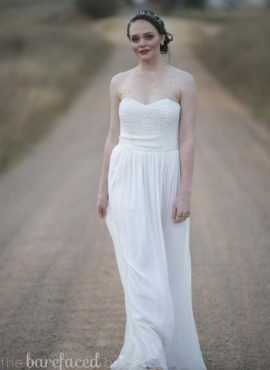 This designer wedding dress is available to try on at The Barefaced Bride studio.